Let’s talk about something serious: Postpartum. It’s a wonderful time, after 9 months of anticipation, you have this wonderful baby that you get hold, love on, and stare at in amazement. There’s so much good that comes from having a baby! But, we’re lying if we say nothing difficult can also come out of it. Sometimes your significant other, or even you, may experience feeling bluesy, anxious, or depressed after having a baby. There’s often a stigma associated with these things, but there shouldn’t be. It’s real, it can be serious, and when left untreated, it can lead down a scary and dangerous path. It’s estimated that 1 in 7 new mothers experience postpartum mood disorders. Before we start, realize that often what gets lumped into Postpartum Depression is actually 3 different mood disorders. Let’s start with Postpartum Depression OR PPD, as it is commonly referred to, is just that: a state of depression after baby is born. Often brought on by a number of things including postpartum hormones, changes in amount and patterns of sleep, or the stress of caring for a helpless new baby. What does it look like? • Bs sad/depressed more than they are happy, and feel disconnected from their baby. • Be tired with little desire to be active, and will often sleep excessively. Next let’s look at the next thing that often gets lumped in with PPD: Postpartum Anxiety or PPA. Though Postpartum Anxiety is often labeled as depression it has some key differences that can impact how you can best support your partner in dealing with this. Like PPD, Postpartum Anxiety is anxiety brought on from the same things, hormones, lack of sleep, and a worry for your baby. But this is not an anxiety that comes and goes. It lingers. • It’s the constant fear that something bad is going to happen to your baby. • It’s racing thoughts and excessive worrying. • It’s a continual cycle of what ifs. • It’s the fear of not being enough for your baby, while not wanting others to care for your baby. It is important to understand and recognize that someone can have postpartum depression and postpartum anxiety simultaneously. The third and final postpartum mood disorder is Postpartum Psychosis. This the most serious and least common of the 3, it occurs in less than 1% of new moms. Although not exclusively connected, it is often more common in moms who have dealt with bipolar disorder or had a family history of it. How is Postpartum Psychosis different from the other two? So dads, you’re probably wondering “What does this have to do with me?” I’m here to tell you that you can be instrumental in supporting your wife and providing the care and help she needs postpartum. How can you help if your wife is suffering from PPD, PPA or PPP? First things first: Talk with her. I know this can be difficult for some men, but communication is key. As can often be the case with mood disorders, she may be in denial or not realize her condition, and may need some encouragement to get the help she needs. With Postpartum Depression and Anxiety, this process may take some time and you may not be able to broach the subject directly, you may need to sidestep a bit. However, if you suspect your wife has Postpartum Psychosis, reach out to medical professional immediately to seek treatment. • Prevention is the best medicine, if your wife has a history of depression, anxiety or bipolar disorder discuss with her doctor early on in pregnancy to get a plan in place. This is not an exhaustive list, and some things may or may not work with your partner’s personality. Study her, talk to her, and most importantly? Listen. Even when she’s not talking, listen to her, encourage her, let her know she’s not alone, and she is not failing. One fear I had going into Fostering was “what if I don’t love the children as much as my own biological children?” And then the follow-up was thinking, I suppose if I didn’t love them as much and they are only here temporarily, that’s not the end of the world, but what if I adopted and I didn’t love that child as much as my bios? I read blogs, Facebook posts, and books where people always just said they loved their foster and adopted children as much as their bios. But, it still scared me. Okay, so those people love their kids as much, but what if I don’t? And frankly, no one can answer that question before they begin fostering or before they’ve adopted, and it may be on a case by case basis. You may have that “as much” love for one child and not another. Last night, I had the opportunity to speak on a panel with a former foster youth who aged out of the system, a reunified parent, and I was representing foster parents during a training for new foster parents. As I was answering a question about the dynamic in our home between bios and fosters, I came to this realization, and voiced it: I love my foster child with the same intensity that I love my biological children. I often think that no one has ever loved their foster child as much as I love mine. But I would be lying if I said it was the same type of love. Before you judge me too harshly, let me give you an example. I love my husband intensely. If the dial goes to a 10, I love him at an 11 (name that movie reference!). I also love my bio children, and I love them at an 11. But it’s a different type of love. Same goes for my parents. 11… but on a different dial. I love them all to the same intensity, but my love for each of them is a love that plays out differently. So, when I say I love my foster son just as much as I love my biological children, I don’t want to give you a false idea about how it may be for you, by leaving it as simple as that. You will (hopefully!!!) love your foster child just as much as you love your bios, but don’t be surprised or feel guilty if that love is different. I don’t know why exactly. Maybe because I co-slept and nursed my bios, so there was that really early physical bonding. Maybe because they are a permanent fixture in my life and in our home. Maybe because I’m parenting with just their father, and not co-parenting with a stranger. I’m sure there are lots of components to the puzzle. If you are considering foster care or adoption (yes, those are two very different categories!) and the fear of loving a stranger is holding you back, I’m here to encourage you, that it is very possible to love a child who is not from your body, just as much as you love your bio kids. If you are currently loving on a foster or adoptive child, and you love them just as much, but it feels a different? That’s okay. I think it’s that way for a lot of us. It doesn’t mean you love them less— it’s just a little different. For getting up 7 times in the night with a screaming baby who doesn’t share your DNA. For googling ways to comfort a baby born addicted to meth, when you feel at a loss. For crying over biological parents’ loss— even if they don’t seem to feel that loss so very much. For singing lullabies to the stranger who moved into your home today and assuring her that she is safe. For quietly patching holes in walls after uncontrollable tantrums. For advocating on his behalf to school teachers, coaches, and friends. For the moments when you stand under the shower shaking with righteous anger on behalf of a child who has had their innocence robbed far too young. For driving miles and miles and miles each week to appointments, visitation, and therapy. For getting the cold shoulder or worse from biological family members and responding in love. For building a relationship with her mother, and seeking to mentor and model what a healthy family looks like. For trying every possible way to help a child with RAD, when everyone else has given up. For supporting reunification when you know your heart will snap. For being willing to become a forever family when her family has disappeared. For being willing to risk. In case no one else has said it, I will. Thank you. Before you bristle too hard at the title, stick with me. Back when Milkman and I started our journey to welcome non-biological children into our home, it was with one goal in mind: adoption. We knew that we wanted to adopt, and we knew that private and international adoption was costly, and were familiar with fostering enough to know that it was a good thing, and thought of it as a means to an end. The end? To adopt a child. When going through our training and our initial home study interviews, we made our goal clear to our agency from the onset. We were a “Foster to Adopt” home. Foster to adopt… that’s totally a thing, right? Our first placement was last July. We were asked to take 2 children for a 3 day stint. We agreed to it firstly because it meant our paperwork would be expedited, and secondly because it was so short term. Those 3 days turned into 3 months, and by the end of it, we informed our agency we were no longer looking strictly for “adoptable kids”, but that we were happy to foster with the intent of reunification. The next baby we fostered came into our home at 5 days old. He was an “open and shut adoption case”. Guess what? He left us to live with a distant relative 3 months later. Not so open and shut. It was really hard, but he was never ours to begin with. 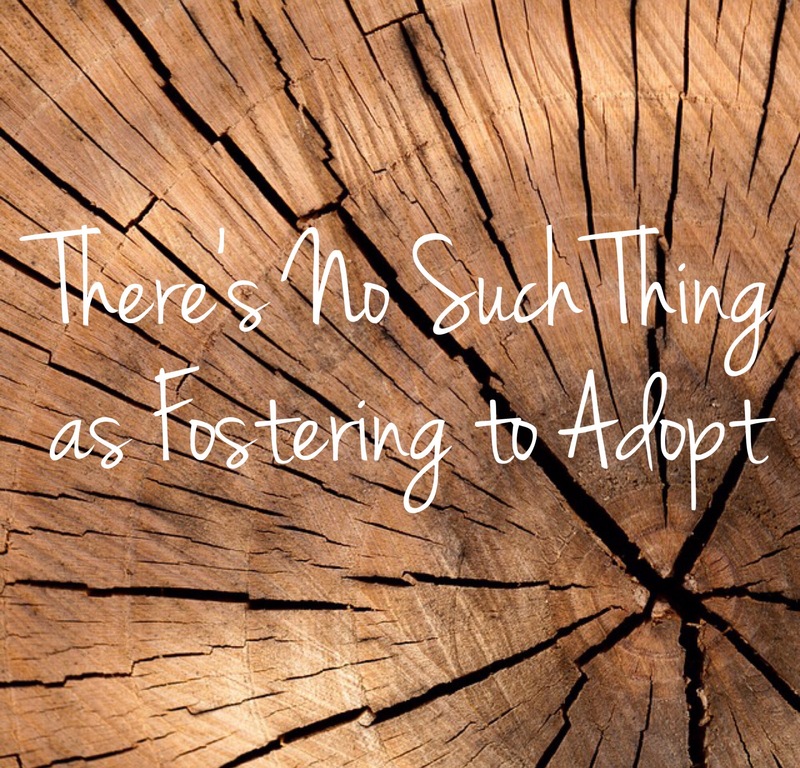 Our current fosterling is headed toward eventual reunification, and though we desire to one day have our forever child via the system, I’ve learned something really important: There is no such thing as Foster to Adopt. The very point of foster care is to be a temporary caregiver. Your social worker could tell you all day that this is a for sure adoption case and even still, foster care should be looked at as a temporary thing. You are to welcome a child into your home, care for them, feed them, love them, protect them, all with the goal of them reunifying. You then tell me, “Well, I have a friend who adopted through foster care! And I’ve seen all those cute pictures with families holding signs that say how long the child has been in foster care, posed next to their forever family on adoption day!” Yes, we all know people who have adopted from foster care. I hope to be one of those people one day. Some of those people didn’t intend on adoption, but it happened that way. For some, adoption was the initial hope. But let’s think about what has to happen for a child to become “adoptable”. If a child in foster care is supposed to be a temporary fix while their biological caregiver gets their ducks in a row, how is it that children are adopted through foster care every day? Because something has gone TERRIBLY wrong. “WRONG?? Adoption isn’t wrong!” I didn’t say that. For a child to become “adoptable” a parent’s rights have to be terminated. Let that sink in for just a second. This means that (in general, there are always exceptions) a parent has been given the tools they need to get their child back, and they couldn’t or wouldn’t use those tools in order to reunify. That’s tragic. Even if the foster family that is set to adopt them is the best family in the world, we cannot brush past the real and awful reality that parent and child have a tie that has been severed. Their flesh and blood has lost the legal right to raise and nurture that child. That’s a terrible thing to have to happen. Would you not agree, that assuming a parent has followed the steps they need to, and is safe, the best place for a child to be is with their biological family? When I say this I really mean “safe” not “my standards”. It’s easy to think you need to fight reunification because your house is bigger, you provide higher quality food, and you dress them nicer. Those aren’t qualifications for being a parent, though. Your job as a foster parent is to love and care for this child, all the while supporting reunification. But what about the parents who are really far gone? Well, of course if a parent is abusive, neglectful, crippled with addiction, or can’t see their way out of a relationship with someone who is, those are the cases where adoption becomes necessary. Am I saying adopting is bad? Absolutely not. It is still mine and Milkman’s deepest desire to adopt a child. But adopting via foster care is a bitter sweet act. One in which a child has to lose one family in order to gain another. And this is why I say, there is no foster to adopt. You foster to foster. You foster to reunify. To help this child and their parent get to a place that is safe enough to become a family again. Adoption, is merely a bittersweet tributary off the main course of foster care. A beautiful, yet tragic thing. So you still want to be a foster parent if it means giving every single child back to their family? If it means your heart is broken into a million pieces, so that a biological mother’s can be made whole again? So that a father can raise his child with his own culture and blood as their bond? If the answer is no, foster care may not be the right road for you. But if the answer is yes? Then you are in the right frame of mind. And maybe, just maybe, your family will grow through adoption one day. But let that not be your main goal in this journey, lest you be entirely disappointed and crushed. However, if you’re willing to take the risk, I can promise you, it is worth every step if the journey. Want to read more unpopular opinions, follow our foster care and bio parenting journey, take a look at our life living on a working farm, and laugh at the stupid memes I post? Come check out She Rocks the Cradle on Facebook.